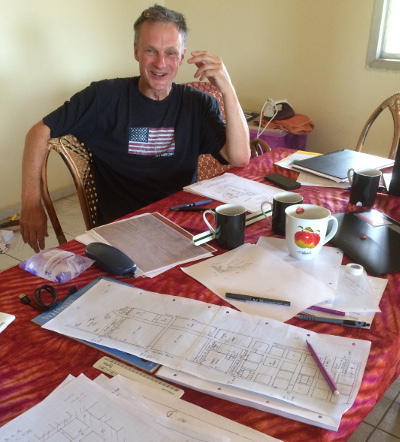 Blog: Low cost housing project in Sierra Leone - MEB Design Ltd.
Mark Eddison from the London office has just spent the last week of September in Sierra Leone working on a low cost housing scheme. He has been working together with the charity Home Leone. See his blog below about the experience. We walked through Cockle Bay’s slum – conveniently 3 floors below our balcony and outside the rear wall’s (secure) gate – amongst a moving active mass of life, mostly lived outdoors, and far removed from our existence above, though geographically adjacent. The tour is an education – something you cannot appreciate on video or from photos. An assault on the senses. Eyes and ears first; then you smell its smells: burning wood, uncollected rubbish, mould and cooked food, before you notice the feel of its textures: rocks, sand, seeping ground water, discarded concrete with protruding reinforcement bars, timber planks, rusting zinc sheets (with colours fit for a retro bar by some Mississippi waterside in the USA), mud, left over rammed concrete blocks, bright textiles, plastic pipes, plastic bottles, metal pots, charcoal, soap suds, dog’s mangy coats and so forth. We find a leaking tin roofed church with walls decorated colourfully in ragged African fabrics, secured to stripped tree branches or better poles, and a half built but used Mosque with no rails or upstands to secure its stairs and first floor landing. Where are the ‘sacred bushes’ of traditional religion? We are told about them but not shown them. The community self polices itself. ‘Bad’ people are forced to leave. It feels cohesive, friendly, safe (there is nowhere to hide), and a community with resilience to which people would return. There is a system. The community has to agree if a new person can move in. It may be a relative or friend of a dweller but the chief will be consulted and there will be a trial period before acceptance. 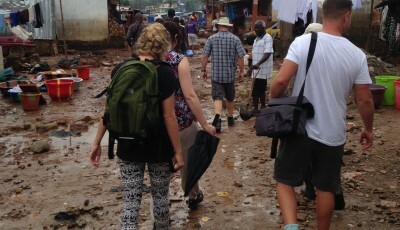 We are told other slums like Croo Bay operate the same way. Then we find one of these chiefs holding court in a meeting room of some kind where a woman is crying over the judgment he has just passed. This chief is a Muslim, happy to greet us and ask us to advocate for his community. Christians and Muslims seem to coexist happily. It’s very dense; cramped dwellings abut more cramped dwellings, connected to others via narrow streets, but there are still open spaces – left for some unknown purpose. And businesses: shops – offering goods, tailors, charcoal sellers and so on, and booming music, and TVs. The place is tight, then gives way to unplanned openness, and good views of Cockle Bay Creek that is edged by a seafront fortified with concrete filled sandbags and car tyres, whilst a pleasant salty sea breeze blows over fishermen’s nets and the occasional traditional shaped boat. A seaside home with a view does not seem so bad here, and there are some who have clearly prospered to have one. We find complexity and layers, as well as a strange beauty. But what about darker things like drugs: there would be no money for hard drugs, or FGM: we would assume this is practiced, mistreated women: who knows, lack of opportunity obviously, and sickness: plenty. As for gangs, there are no signs. Its really only sewage and rubbish disposal systems that blight this place: open drain ditches bisect the land. Every 50 yards or so effluence discharges into the sea, and added to this waste and the uncollected rubbish, is the knowledge that what comes through the site to the sea is already contaminated from muck produced further up the town and will be flushed through the site in the next heavy rain if other rubbish has not caused a blockage. This must be a difficult place when the rains clean the sewers. Cockle Bay appears to be on less marginal land than other slums because its land is flat and a seafront. Other land has been subject to floods (elsewhere it might be landslides) on which no-one had built till recently for obvious reasons. Natural disasters start as natural events but only become disasters when people get in the way. And it’s the economic poor who often do in large numbers in these kinds of places. There should be no floods here unless the sea gets bad. 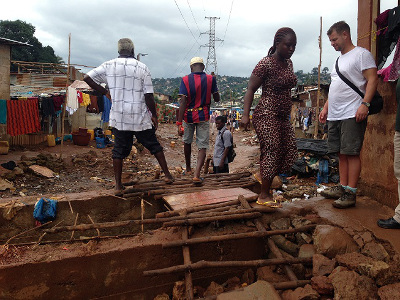 But recent rains have devastated homes in other Freetown slums and produced some tragic and painful stories. And many are currently holed up in the town’s stadium with nowhere to go and no resources to live by, because of what’s been washed away. Home Leone’s project might be described unfairly as a ‘slum clearance’ scheme, but is more palatably a ‘low cost housing’ experiment. All solutions for these slums seem bad options, but HLs proposal looks the least bad. 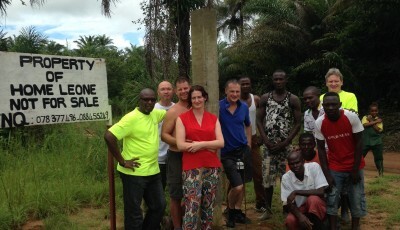 It is no comfort to design a solution with a western mindset that will intervene in strong settled communities and social structures on another continent, but at least Nigel Hyde of Home Leone, with the help of local advice is offering a thoughtful solution and a place for those who have been displaced to go. Can a community reform and recover in a different location? How long will it take? Who goes? By what criteria? And on what economic model? There are no simple answers. Given the environmental instability, people need to get off marginal land. But what will keep them staying where they end up? Will they return, drawn back by some magnet? Why not renovate slums instead? But if so, how in Freetown, without temporary clearance and disruption to make the environment and the land secure first?